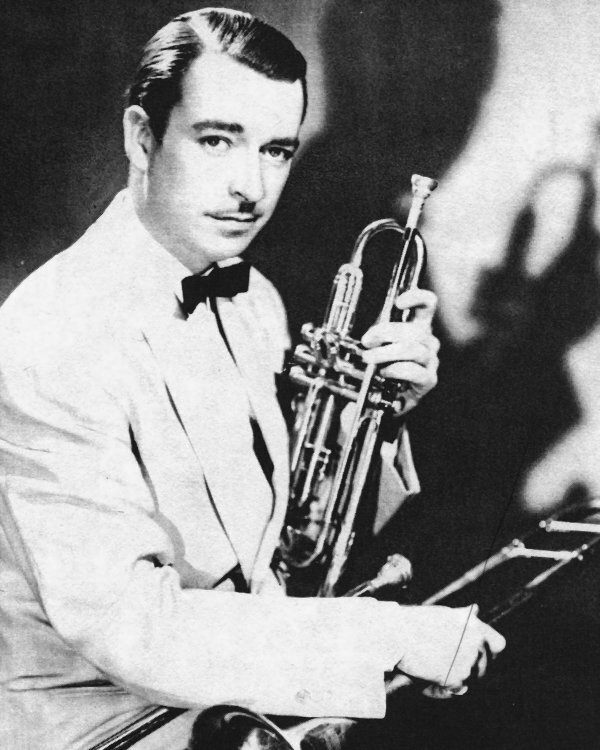 Noted for his ability to hit the high notes on a trumpet, bandleader Sonny Dunham was given the nickname “Man from Mars” by members of the Bob Crosby Orchestra. Dunham, however, began his career on trombone, playing with local bands around the Boston area. In the late 1920s, he moved to New York and spent six months with Ben Bernie before joining Paul Tremaine’s orchestra in 1929, where he also arranged and sang. While with Tremaine, he switched to trumpet and in 1931 left to form his own group, Sonny Dunham and his New York Yankees. The band lasted only a few months. In 1932, Dunham joined the Casa Loma Orchestra, becoming a popular soloist and scoring a big hit with his trumpet work on “Memories of You.” In late 1936, he left to form another, more unusual group. His new outfit featured 14 pieces, with ten of his musicians doubling on trumpet. The band failed to secure adequate bookings, however, and Dunham spent three months living in Europe before returning to the states and the Casa Loma Orchestra in 1937. He remained with them until 1940, when he again tried to form his own group. For Dunham, the third time was a charm. Backed by a trumpet mouthpiece manufacturer, his new orchestra toured the country, playing at top spots and holding talent searches along the way. The gimmick paid off both in publicity for the band and in discovering a valuable asset, trumpeter Pete Candoli. After the talent searches ended, Dunham’s band lost some of its momentum. Despite some good arrangements and talented musicians, it never managed to reach great heights. Trombonist Kai Winding got his start with Dunham, as did sax player Corky Corcoran. Frank Comstock provided arrangements for the band’s first two years. George Williams also arranged. Singer Dorothy Claire joined the group in 1943, and Carolyn Grey sang with the band in 1944. Other vocalists included Harriet Clark, Don Darcy, Billy Usher, Ray Kellogg, Ray Wetzel, Paul Carley, and a group called the Sonny Siders, which included June Hiett and Harold Grogan, who appeared with the band in 1946. In early 1951, Dunham decided to disband. He didn’t stay away for long however. He spent a short time with both Bernie Mann and Tommy Dorsey before forming a new group later that same year. In the 1960s, he moved to Florida, where he continued to lead a band, switching back to the trombone.